Andre Choquette is an accountant from someplace I've never heard of called Maple Ridge, B.C., and he's about to become rich beyond the dreams of Regis Philbin. Mr Choquette is the owner of the Internet address www.income.com, for which he has been offered $3.2-million. Now, www.income.com isn't a business. It's not even a website. There's nothing there. All this guy owns is the address. And all he did to get it was be first in line to register the name and pay an annual registration fee of $70 for the first two years and $35 each year after that. Mr Choquette has "owned" www.income.com for five years. That's $3.2-million on a total investment of $275 — and how's your RRSP doing? Now I bring this up not to slag the guy. I'm sure he's a nice fellow in a late-'80s, I'm-worth-it, money-grubbing sort of way. My aim is to bring your attention to the alarming, shortage of decent web, addresses (also called "URLs" or "domain names"). Here's the problem: websites don't really have names; in truth, they're all numbered. The Ottawa Citizen site, for example, is, actually http://204.187.152.136. But that's hard to remember and looks really silly on the side of a newspaper box, so they've rigged the system to accept names. But the Internet is a global network, and no matter what you call yourself there's always somebody, someplace calling himself the same thing. At first, it was easy to work around. If www.citizen.com is taken (and it is), just add "ottawa" and you're good-to-go. This worked for a while, but today there are, literally, millions of websites and there just aren't any good names left. So companies are forced to settle for really dumb names just to get a web address. Hypothetical example: You're a self employed, vehicular sanitation professional — a squeegee kid. Hip to the digital wave, you decide to take your business on-line, become an e-squeegee, so to speak. You go to register your URL and are shocked to discover that www.squeegee.com is already taken. No biggie; try www.sgueegeekid.com, but that's gone, too. Now you're worried, especially as sparechange.com, windshieldwiper.com and highvisibility.com are also unavailable. At the end of the day you're stuck with a domain name so ridiculous nobody's grabbed it. That's right you're the marketing genius behind www.gimmeeadollar.com. This happens all the time. I worked recently on the renaming of a local high-tech firm. I can't go into too much detail here (not because I signed a confidentiality agreement or anything; it's just not that all-fired fascinating), but suffice to say that you would not believe how hard it is to find a word or word-combination that someone has not already taken. All this has led to a parade of crummy names, most of which make the Gimme A Dollar Corporation sound not half-bad. Now I'm not the first person to complain about the domain name shortage. In fact, the folks in charge of web addresses are already planning to roll out a few new URL suffixes. So far "dot-firm" and "dot-biz" are the front-runners. I've got a much better idea, but I'm going to keep you hanging on for a few more paragraphs while I remind you that the Internet is simply chock full of over-hyped dot-com companies with as much chance of making a profit as I do of growing my hair back. 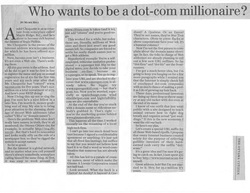 These days, professional investors are lining up three deep to throw money at any old racket with dot-com at the end of its name. I know of one outfit that just went public with a site designed to teach animal owners how to fight dog breath and organize actual "pet weddings." If this is the new economy, I want the old one back. So here's my plan. Let's create a special URL suffix for all those web-based rip-offs. 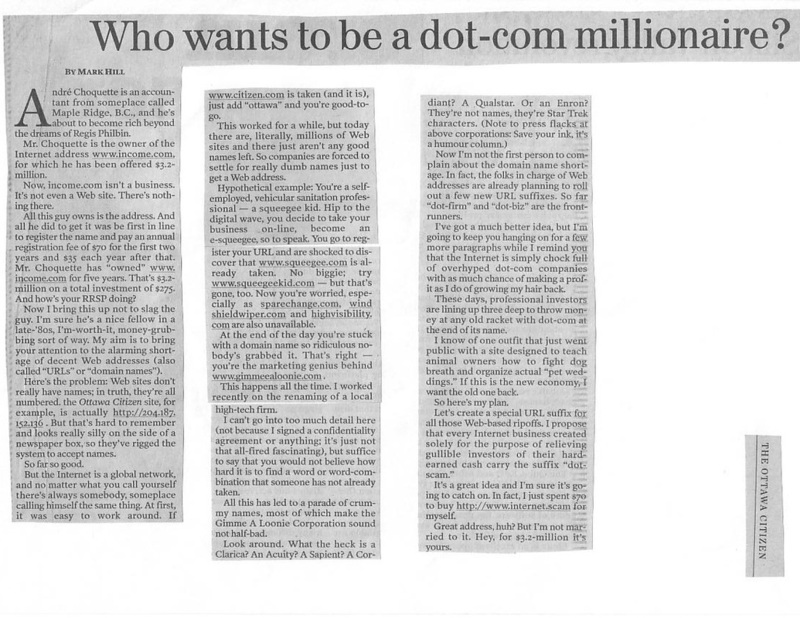 I propose that every Internet business created solely for the purpose of relieving gullible investors of their hard-earned cash carry the suffix "dot-scam." It's a great idea and I'm sure it's going to catch, on. In fact, I just spent $70 to buy www.income.scam for myself. Great address huh? But I'm not married to it. Hey, for $3.2-million it's yours.